This was my first ‘traditional’ multi-block Japanese woodblock print. It was made during a two week workshop taught by Hiroki Morinoue at Anderson Ranch Arts Center in Snowmass, Colorado. That was a life-changing experience — VERY stimulating — and launched me into a whole new world of moku-hanga (traditional Japanese woodblock printmaking)! WOW! Total immersion for two solid weeks, sunup until late, late, late into the night! SO worth every minute spent! Hiroki, by the way, was a GREAT instructor — totally patient, talented, gentle, and very knowledgable — if you ever have the chance to work with him, don’t hesitate! 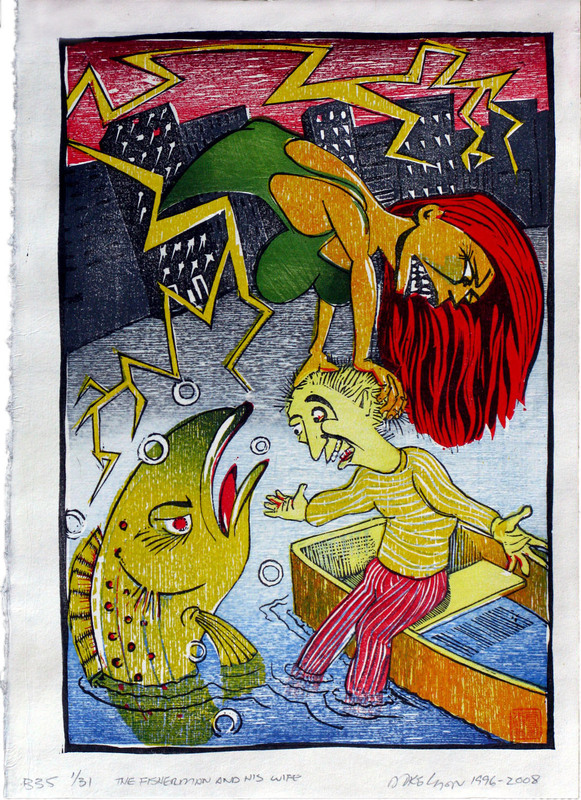 "The Fisherman and his Wife", 1996, 15 x 10 inches, polychrome woodblock print from 5 blocks. the 'plan' for the print, my original drawing in graphite with colored pencil and kento registration marked. In 2008, I printed an edition of 31 for Baren Forum exchange #35 -- same blocks, but maybe my technique has improved over a dozen years -- at least I'm FASTER now! The blocks were carved in June 1996 in parody of Hiroshige’s 100 Views of Edo (mimicking point of view and red/yellow/blue palette, with black cartoony outlines. I’d never really editioned these blocks and hadn’t gotten great prints from them, either – but I like the design and it fit the fairy tale theme, so I improved the carving to reduce blotching and have reprinted the original color scheme but with now greater facility in the medium. These are more or less my original intention actually – it’s only taken a dozen years! 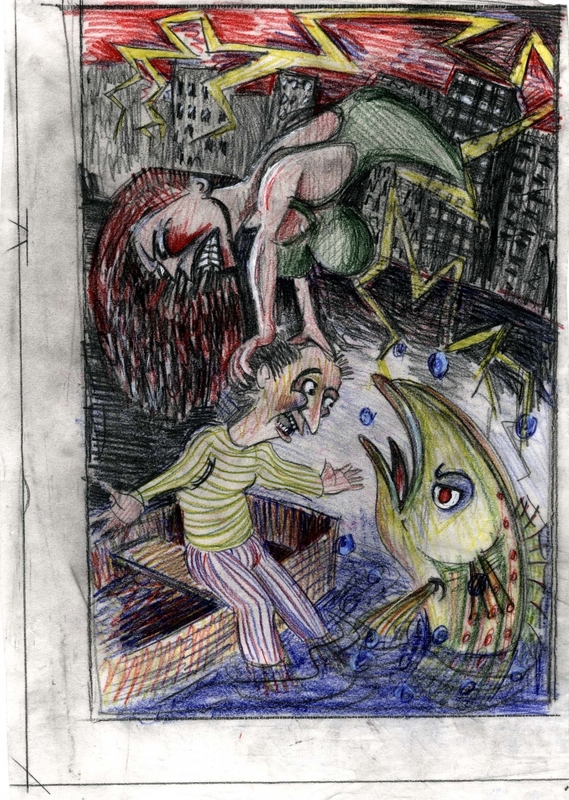 Once upon a time a simple fisherman and his wife lived by the sea in a filthy little hovel. Every day, the fisherman would row out in his little boat and cast his nets. Sometimes he was lucky with the fishing and sometimes he was not. One day, the fisherman pulled in his net to discover an enormous fish struggling inside. As the fisherman tried to get it in the boat, the fish began to plead with him, begging to be released back into the sea. The fisherman was very surprised that any fish could speak and he felt pity for the fish and released it and the fish quickly swam away. As he rowed back to shore with nothing to show for his day’s work, he looked forward to telling his wife about that unusual fish. 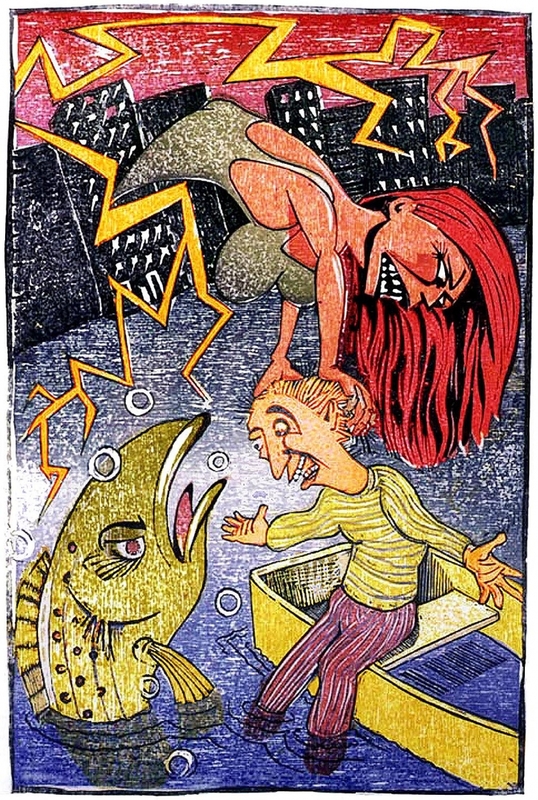 When heard about the talking fish, the fisherman’s wife became angry and abusive. “Here we are, not even a crust of bread to eat much less any fish, you worthless idiot of a husband! That fish was magic! You should have made it grant you a wish in return for letting it go! Now you get back in your boat and find that fish and tell it we want a nice clean little cottage instead of this filthy hovel, and don’t come back until it’s done!” she screamed at him. “But it’s cold and it’s night and I won’t be able to find the fish,” said the fisherman. “GO!” said the wife. And there was no changing her mind, nor shutting her up, so he went, even though it was the middle of the night and he’d had no sleep and nothing to eat for several days. So the fisherman rowed home and right where their filthy hovel had been now stood a beautiful little cottage, freshly white-washed, with shutters and smoke coming out of it’s brick chimney, and inside was a wonderful dinner on the table and his wife wearing some new clothes. And she seemed satisfied for a while. And when the fisherman got to shore, in place of the little cottage there was a big castle with turrets and flags and soldiers on horseback riding back and forth bugling. When he tried to enter, two guards with halberds barred his way and wouldn’t let him in until his wife, the queen of the castle, finally ordered them to let him come in. She looked very royal in her fancy velvet clothes with gold embroidery and jeweled crown and scepter and the fisherman was afraid even to look at her. So he tried very hard to make himself small and beneath her royal notice and he hoped that she would now be content. But it wasn’t long before she sent the guards to find him and bring him before her. And when he was made to kneel down, she commanded him to row back out to sea and she gave him precise instructions. And the little fisherman was so frightened he could barely speak at all, but he managed to explain that his wife was no longer satisfied just being queen. Now she wanted to be ruler of the universe and lord of creation. And at this, so much lightening crackled all around that the little fisherman was truly in fear for his life. And the little fisherman rowed back to shore and instead of the huge castle, there was a filthy little falling-down hovel and his wife standing outside dressed in her old rags. And the old couple struggled to survive there for the rest of their days.